Do you want a solid boot from a great manufacturer that feels good and performs well? You’ve found the right boot. The O’Neal Racing Element Motocross Boot steps into a class all its own and takes its place on top of the podium as the best Element Boot to date. A reinforced shin plate along with a bonded sole and reinforced side panels keep impacts from stopping your race early. Ample amounts of heel support and ankle padding combine with a new buckle design to positively secure your foot making the boot feel like an extension of your foot while operating the controls. You’ll look good at the top too. A genuine leather, medial, heat shield keeps your calves from melting and an elastic gaiter keeps debris out and your socks white. With 40 years in the business O’Neal knows what they’re doing. They got this boot right. The O’Neal Racing Element boot fills every racers’ needs with ease; Leaving more money in your pocket, a smile on your face, and new boots on your feet. Fit perfect. Comfortable. Seems like they will protect well. 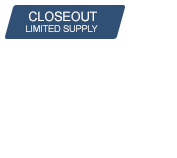 Really good value on a pair of inexpensive boots that also look and perform well. They do fit slightly small and narrow in the footbed. I have slightly wide feet and their a little squished, but its not too bad. I would still highly recommend them for their price. Just got my new element boots and I must say they fit and feel great! Size is true as advertised. Haven't ridden in them yet but I'm very happy with my purchase! No complaints, good comfortable boot for the price. For me these boots worked great because I'm size 12 but with skinny legs and most size 12 are too big for my ankles and calfs, but this fit amazing. If you have bigger legs I think they will be too tight but they break in quick so its no big deal. Overall: 8/10 just because I've had better boots but these are still very good. Fit great. Haven’t worn them out riding yet. I have a hard to fit foot and they said to order one size larger than your foot size. They fit great. Like the title says its the only boot I'll wear. My first set of boots were the fly maveriks 5 years ago and they were ok until I started to feel out what I liked as far as gear. I've even tried my one buddies gaerne sg12's and did not like them as much as these boots. I guess its just rider preference and maybe one day I'll move onto somthing else but for now this is all I wear. I'm on my second pair now and the design changed a lil but still loving them! I normally wear 11 1/2 so I got a size 12. Perfect fit and very comfortable straight out of the box. Great price and very well made. perfect, use it for commuting and hitting the fire roads on the way home. this has to be the most comfortable riding boot ive owned yet. true to size, sturdy and havent had any issues with the quality of the boot. I wear a 13 in most shoes and I got a 13. It was a little on the tighter side, but fit. i have bigger calves and didn't notice it being too tight around calves. I can't give a rating on durability as I only used them once so far, but what I can tell you is that if you go through any type of water....your feet are gonna be soaked. Other than that, held up pretty good. Pretty comfortable and had decent range of motion. Great fit, Had them for a year and still look and feel great. Great value, good fit, protection I wanted. Excellent price. Break in was moderately quick and they are really quite comfortable, and the buckles are nice. I mean they are no A-Star Tech 10's but they're also 1/4 the price. Love them and would recommend for anyone buying there first boots to buy these ones ???? These were great right out of the box. I'm an 11-11.5 shoe size, I got the 12 and they fit perfect. I have bigger calves and not having the Velcro closure up top made these so much more comfortable. They broke in fast, my husband loves them! Great Boots. The whole family uses them. Good fit, protection and fit..Not a walking boot, there riding boots. Very well made for the price & comfortable. I would recommend these boots. Nice fit & they look great! Love the look and feel of these boots, would recommend them for the money. Great product. Hard to beat these for the price . Comfortable boot for trail riding . I've been looking to get a good off road boot and this is the one! I love how these boots look and how affordable they are. Really good boot for the price. Fit really well and I believe the protetion is going to be more than adequate. Buckles are really nice. I'm as woods ricer do these fit what I do on the money. Being older I don't ride quite as reckless as I used to. Great value. The boots fit great, very comfortable, they look very high end. I bought the white ones and i would definitely buy them again. My brother saw them and decided it was time for him to get new ones. The price is good for the quality; however, they are not waterproof. The boot fits true to sizing, which is good being I'm size 15. Breaks in well, a little nosey off the bike walking around. Outstanding boot for the price!!! I've been on 4 two hour rides with these new boots. They have broken in nice and its now easier to brake and shift. The calf opening is very large so the fit is over sized on me. There are no pinch or binding spots inside and they are fine to walk in. The tread (no image of that on the website) or should I say lack of tread? The limited tread is fine for hard pack but not for loose gravel, dirt or mud. Overall I'm please with the comfort of the boots, you get a lot of boot for the price. These boots fit great. The representative was very helpful in deciding which style/brand would fit me the best. Great boot. My sons foot keeps growing and I cannot justify paying 500 at this point. This will be the 3rd pair of this boots we have had and they are pretty good. Great job Rocky Mountain ATV/MC. 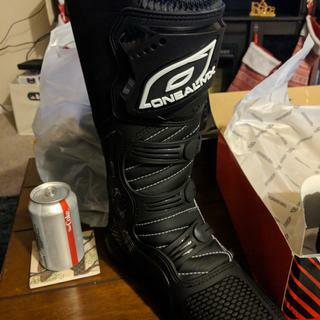 Ordered these on 06/07 and received on 06/08 just in time to go ride. Can't ask for better service! Was very pleased with my purchase. Fast delivery. Great Fit. Solid Boots. I would definitely buy this boot again. It is a great boot for the price and very comfortable compared to other boots that I have tried. Awesome starter boot. 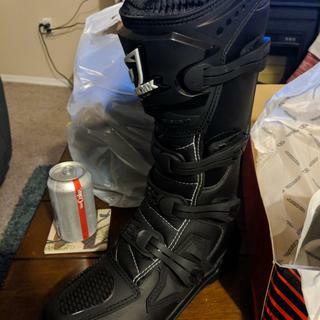 This is my first moto boot and it does the job. I would recommend this to anyone else that is just starting out. Fit is pretty true to size and materials used are definitely going to get me through a few seasons. The more I ride it, the more I can see what I'll look for in my next boot. 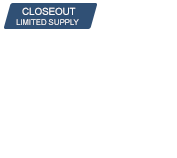 For example, # of buckles and type of buckle/closure system. These buckles should hold up for now, but as i become a more aggressive rider and more confident, I'll probably need a boot that can hold up to more. For the price they are a very good boot. If you have the extra couple bucks I would suggest getting a boot made with better materials. I've bought 4 pairs of these now since my kids keep outgrowing them. We've been really happy with them. They're very good boots and priced right. These boots fit great, and broke in quick. Great deal for the price, and comfortable to wear all day, even with larger calves. For the price they are a great boot. According to my son they feel good right out of the box. Are these a wide or narrow fit? BEST ANSWER: My shoe size is a 14 narrow. I have plenty of room. There is a lot of padding inside so I believe a average or wide foot would fit nicely too. Regular fit.. My feet are wider than normal and they fit my feet good. I wouldn't classify them wide but they are wider than normal. I have wider feet and they are a little snug, definitely don't have any complaints though. They are a good boot for the price. I wear wide new balance shoes and these boots fit me just fine. Do these boots run in the same size as shoes? BEST ANSWER: I wear a size 12 in shoe and the same in these boots. If anything, they are a tab bit bigger in the toe-box than my shoes are. But this hasn't affected my riding at all. I barely notice. For the price, these are great starter boots and should last a while. I've had mine for just over a year now with no issues. I've ordered 5 pairs of these for my kids, and YES I do believe they run very true to show size. However my kids generally prefer them slightly larger since they wear a heavier riding sock compared shoes. Example my oldest wears a size 8.5 tennis, and the size 9 boot fits great with his heavy riding sock. I would say yes. I wear a size 11 shoe and ordered these in size 11 and fit great. No complaints. Great MX boot for the price. I've already recommended them to a few friends. Great boot for the price. I wear an 11 shoe, and bought size 12 because I like to err on the side of too big. They actually fit perfect so I would say that they run a half size small. Yes and they were an exceptional value too. I have used them on a dozen rides and they fit well and have been holding up well. They run small. I am a size 10 shoe and purchased size 11 boots. Great boots for the money! For me, the size was perfect. I wear a size 12 shoe and these size 12 boots fit perfectly. I wear a size 14 boot, and these were spot on. Yes the boots run true to shoe size. Yes, they do and mine fit perfect. BEST ANSWER: Pretty sure they are not steel toe, but they are very stiff to the point I can't squish the toe with my hand. So in other words they are very protective. No steel toe, but very stiff plastic over all in construction. These are like a ski boot. Flexible at the ankle after a few rides. No, they are not steal toe. Are these boots stiff of flexible? I’ve been buying these for years. They seem to be getting stiff around the ankle. I have not tried 2018 versions yet though. Love these boots, definitely more flexible than stiff, please do not let the price fool you! BEST ANSWER: I cant say that they are 100% waterproof but I've not had any major issues riding through streams and creeks while wearing mine. Yes waterproof but only 1/2 way up the boot. The liner behind the buckles stops about mid way up the boot. No, if you go through puddles water gets through pretty quickly. I have large calves, is the top opening substantial? BEST ANSWER: I also have larger calves and I'm still able to properly secure the boots in addition to having some fairly sizeable shin/knee guards tucked in as well. 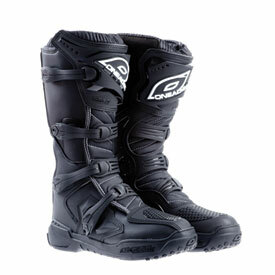 Great boot for the money, also the soles seem to be impervious to wear from the foot pegs. I should be. Its adjustable. Are these men or women's size? BEST ANSWER: This question may be better directed to RCMT customer service, but I believe based on the way the listing reads, these would be men's size. I think womens are listed specifically as "womens" in that section. I am looking for a boot that fits wide calves? BEST ANSWER: I also have larger calves. The boots fit well and even allow me to wear shin guards/knee protectors. I think it is a great boot for the money. They have held up very well, in fact, the soles show no sign of wear after a 1000 plus miles of trail riding. This will fit wide calves! The top of the boot has adjustable Velcro closure as well as the buckle to accommodate even the biggest of calves. Are these light compared to other boots in the same price range? BEST ANSWER: I bought them for husband. He hasn’t Complained about them feeling heavy. I think they are average weight for boots of similar price range. They are however much lighter than his old boots. Very Light, been using these boots for 2 years now, (desert racing) still look new, my legs dont feel the weight! I would say yes, but I’ve only had (2) other pairs of boots, these are my favorite! Very comfortable! Is the shoe size aus or us? BEST ANSWER: The sizing is in US measurement. Do you have a size 9 on sale please? BEST ANSWER: It looks like we only have the white boot in the size 9. I have a 23-24inch calf at its biggest circumference, I wear a size 11-11.5 boot. Will this boot or any boot work for that matter? BEST ANSWER: No, i’ve Had them for a year, they were initially very stiff but have broken in over time. They show very little wear after 500 plus miles of rugged New England trails.